Huawei Mate 10 Lite is one of the top-notch choice in the mid-range market of smartphones. It does offer a solid package of hardware under not very high price tag. What does attract most? 4 cameras, 2 for front and 2 for rear side. This is reportedly first Huawei’s phone with 4 cameras. As the name suggests, it is a "lightweight" version of Huawei Mate 10 Pro, but the word lite does not mean that it is not enough power. Huawei has a habit of covering various customers with various models. The company is the addict of making three version of one smartphone, one simple edition, one pro version and one lightweight choice for people who do not like to spend a lot. And this is good as it enables almost every fan of a company to grab hands on phones from a company. In simple words, I would like to say that Huawei makes three companions for three types of markets and the company is quite successful in this mission. Compared to others, this trick is good. Other companies like Samsung do act a little differently, it produces different lineups for covering different markets, like Galaxy S series for professionals and Galaxy J series for those who do not like to pay a lot. Huawei Mate 10 Lite smartphone beautifully, it does not compromise on specs and performance a lot. After viewing a Huawei Mate 10 Lite review, people can easily make selection due to its simple to understand overview. This Huawei phone works smoothly and does try to everything that matter when a customer comes to picking the best phone of a market. This is what made Huawei comfortable to grab a large portion of the profit from markets all over the world with this impressive phone. The trick of two cameras is good, the additional camera is optimized to help as a depth sensor for focusing deeply. It does rise ability to focus powerfully when shooting in grounds. Yes, the handset is very impressive to look at. Huawei is an expert in making eye-catching units that attract all over the world. It has enabled Huawei to gain massive respect in the world. And Huawei 10 Lite is one of the good options to do a little more. It is made of solid material, a material that tries to survive against accidental scratches and dents. To build the enclosure used premium materials, it has a metal side frame and back. The use of metal gives you a great protection over dents and scratches if you drop your handset many times in a day. In past, there were phones covered with plastic material and they were quite simple to break. But with the passage of time, so many companies have adopted the use of aluminum so that you can have solid protection instead of worrying about expensive phones you buy and crack on first (due to accident dropping). Now even aluminum has become a big trend that let you attract beautifully. Huawei has used metal on sides of smartphone and at a rear side. But overall, there are also the usual plastic inserts that improve the reception quality of communication. Front panel covers protective glass, made with a 2.5 D effect. But so many people not get not very happy due to lack of Corning Gorilla Glass protection and I would like to say that they have right to do so. But the frame around the perimeter of the display is small, but they are so minimal. This is the edge to edge design you might love. But I would not call it a true edge-to-edge panel as there are many other options that feel a little better like Xiaomi Mi Mix 2s. This Huawei phone is similar to older phones but it has tried to look differently similar to its big brothers, the Huawei Mate 10 and Mate 10 Pro. According to tradition, under the display, there is no functional elements, only the manufacturer's logo emblazoned. Top arranged the usual set of sensors, conversational speaker events and led front camera provided by the dual module. Already out of the box labeled display film that provides reliable protection against scratches. But the phone had survived the drop and better glue glass. When you purchase you will have the choice of options in black or blue chassis performance. All edges are rounded, giving easy grip hand and there is no discomfort during use. All of the functional elements are at their usual spot, in this respect, the manufacturer has developed the easy-to-use formula and continues to follow it in every Smartphone. Huawei Mate 10 Lite review acquaints with the fact that the volume rocker is installed right as well as the power key. The left brink took the hybrid slot. We once again faced with the choice of the second SIM card or microSD card that not everyone will appreciate. On the top panel made only an additional microphone, effectively overwhelming background noise during a call or video recording. Overall, the smartphone has an eye-catching look and feel. And I do not think that the absence of corning gorilla glass protection is a major shortcoming you can get irritated with. Simply, make use of an extra temper glass that does not cost a lot but it will try to not let you worried about protection. And this is true, extra accessories can change the look and feel of the smartphone with extra protection. They try to enhance the usability of a smartphone, along with extra beauty you can take advantage of. Huawei Mate 10 Lite has a tall and high-resolution display you can like a lot. The first thing that catches your eye is the size of the screen Mate 10 Lite, equal to 5.9 inches. It has a 5.9-inches screen panel based on IPS LCD technology. So many companies have started using OLED panels, mostly made by Samsung that are famous as Super AMOLED displays. The OnePlus 5t is one of best example you can take, as it is available with the similar price tag to Huawei Mate 10 Lite price. Huawei achieved this by setting the display aspect ratio 2:1. Its physical size is approximately the same as the screen 5.5 inch OnePlus 5 with 16:9. With attractive edges of Huawei Mate 10 Lite fits well in the hand. Its back is made of durable Aluminum, and volume buttons and inclusion are to the right. At the bottom end has a single speaker, MicroUSB port, and 3.5 mm connector. This is good to use USB C port now, USB-C should be part of all phones in the year 2018, except the cheapest. On the back of the smartphone, there is a fingerprint scanner. One can unlock the phone with one click, even from standby mode. Directly above the scanner, you get a module with two cameras. A reader here is too close to the cameras, so if you try to unlock the phone, you can accidentally leave imprints on the module. Mate 10 Lite display, as the flagship models, display Huawei Mate 10 Lite takes up most of the front panel. The 5.9-inch screen has aspect ratio 18:9 and resolution 2160 × 1080 Full HD +. This LCD display, so the colors are not as bright as the AMOLED, but the image is clear, and if necessary, you can change the brightness. Screen angles are not rounded, like other frameless displays, but look attractive and fit the design. Visibility at display Mate 10 Lite is good, but the black color becomes gray if a strong slope. Brightness reaches about 500 nits, making it possible to review content even in bright, sunny weather. Automatic brightness here easily adjusts to ambient lighting. Just like other trendy phones of a market, Huawei’s Mate 10 has the screen of 18:9 ratio. The display has hovered around 76.5% screen-to-body ratio which is good, it does give a beautiful look. What does matter most? Where does Huawei Mate 10 Lite rank? It does rank in the list of best touchscreen smartphones you can grab this year. A phone with large 5.99-inches display based on full HD+ resolution (1080 x 2160 pixels) based on 409ppi density. This is good, it does look very big in hands. The speed of smartphone is a big matter when choosing the best phone walking in a market. Processor performance and memory are impressive, Huawei Mate 10 Lite works smoothly, applications open quickly, with very rare interruptions. Under the body, it has an 8-core processor from Huawei-659 Kirin with four Cortex-A53 2.36 GHz + 4-core Cortex-A53 1.7 GHz) and 4 GB of RAM. This processor is mid-level performance. Kirin 659 in tests behind Snapdragon 820 almost half. Mate 10 Lite comes with 64 GB of memory for custom applications and media available about 48 GB. It's not so bad, because most phones in this price range have only 32 GB. Here there is also an option to expand the memory with a slot for a SIM card, which means the simultaneous use of two cards or one Nano-SIM or Nano-SIM + MicroSD. 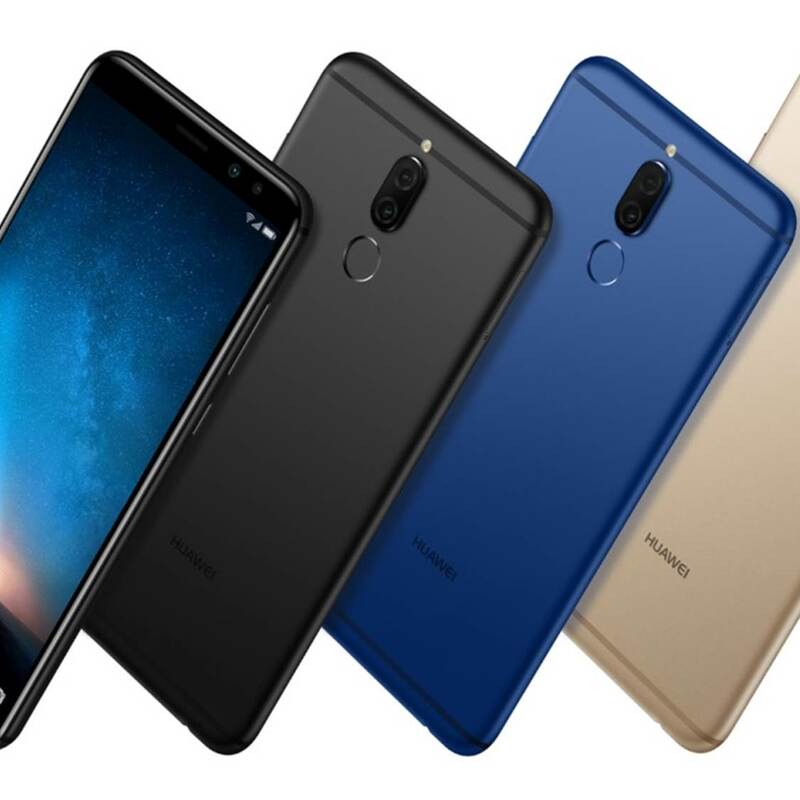 Communications and connectivity Huawei Mate Lite has 10 4 g LTE with support for the following bands: FDD LTE: ranges 1, 3, 7, 8, 20. Other connectivity options include GPS, dual-channel Wi-Fi 802.11 b/g/n 2.4 Hz and Bluetooth 4.2. NFC support here is missing. Emotion interface has some interesting features like gestures: you can draw a letter to quickly launch applications or doing screenshots. Huawei Mate 10 Lite also features a dual application, you can use them to run two accounts one application, for example, if you manage two social accounts. If you follow the technology news, you may have noticed Apple's war announcement by the Chinese manufacturer Huawei. The latter wants to prove that he is able to produce no less high-quality mobile devices. Due to its ambitious statements, Huawei makes to evaluate its smartphones with special rigor. Several times this led to the fact that her devices left a sense of frustration, even the flagship models. This time we will not wait much since Huawei Mate 10 Lite is considered from the middle price segment. However, the frameless screen and four cameras show that there are some ambitions here. Huawei has managed to take on many companies with its powerful smartphones. The company has managed to gain massive reputation. How many things support this company to gain huge profit when selling a new phone? Huawei Mate 10 Lite has a processor made by Huawei, instead of using MediaTek and other chips. So many smartphones made Huawei use processors made by Huawei. This is one impressive point that company has used impressively to earn huge profit. Huawei is earning the almost full profit when selling this phone. Other companies do work a little differently, many rivals of Huawei are using chips made by other companies. Even sale of MediaTek Helio 22 is increased a lot. There are many reasons that force us to say Huawei Mate 10 Lite is one of the best smartphone and Huawei is earning a lot from this lineup. This is one of a most important part that attracts customers to buy this phone. This phone has four cameras, the camera has two cameras on the front side and two cameras on the rear side. On the back, there is a duo of 16 MP + 2 MP (with f/2.2 aperture) and on the front side, there is a duo of 13MP + 2MP (with f/2.0 aperture). In both cases, additional luggage needs in portraits and use bokeh effect. This function works fine only with good lighting. The camera application has standard settings: timer, netting, capturing smiles, mute option, object tracking, etc. "setting image" Option is responsible for the saturation, contrast, and brightness of the images. The rear-sided camera is good, the one 16MP sensor is equipped with f/2.2 aperture and 27mm focal length. The second 2 MP camera is a depth sensor but it does not offer autofocus. Huawei chose an unconventional way to draw attention to this model. The camera is not one or two, but four different, two front and back. It looks great on paper, but in reality, it's not that good. But overall, I would not say there are very poor. Overall performance is good, this is not an ordinary camera setup that just draws attention but denies to help. The use of two cameras is good, why do I need a second module? When compared to Apple, which added a telephoto lens to get an analog zoom, Mate 10 Lite uses a helper module to get the effect of the image depth when shooting in portrait mode. Some smartphones blur the background using software algorithms, but in this case, the second lens is used. Theoretically, the result should be more qualitative, in practice, it is not so. In general, the quality of the photos above average, but only in perfect light. Then you get juicy colors and good contrast, but the detailing still leaves much to be desired. Portrait mode is activated by a radio button in the camera application, it adds depth effect, although it would not interfere with the optimization, because the blur falls on the object in the foreground. In low light, camera performance falls quickly. The annoying digital noise appears the colors become blurred and dim. Depending on the lighting, the camera can completely confuse the colors. Thus, the combination of the four chambers does not give any special results. The bokeh effect does not hurt, but it is strange to have a second camera just for him. Overall, the bokeh effect is good to use on the Mate 10 Lite. In the work of the camera, the smartphone shows its hardware limitation. For example, image processing might be better because sometimes it takes a couple of seconds to analyze a portrait image before you get a photo. Blurs the image not only the second camera but also the software part, because of a weak processor, it takes quite a lot of time. To switch to another mode shooting on Mate 10 Lite, you have to hold your finger on the left side of the camera, and drop-down list, select Pro Photo (RAW) and Pro Video (you can use manual focus and set white balance). Quality images with basic configuration, Huawei 10 Mate photo Lite does a pretty detailed and clear. Using the option "adjusting the image", you can increase the saturation and contrast, then pictures will look even better. In low light performance, cameras Mate 10 Lite dropping shots turn out blurry. Here you do not see help by any settings, for best results, you can try to keep the camera for a bit longer in one position or set on a tripod. Led Flash here is not always effective, sometimes produces photos with red eyes. Front camera Mate 10 Lite makes very detailed self, but the color is too pink. Portrait shooting mode on both cameras, both rear and front-facing cameras have the portrait mode that works well, especially considering that this function is only available on expensive phones. Of course, don't expect professional results, but for its small sensor Mate, 10 Lite copes. The quality of filming video camera, Huawei Mate 10 Lite does not support the resolution of 4K, even videos 1080 p lacks detail, and the backlight is very blurred. Though here and there is basic stabilization, but picture quality is much to be desired. In the end, I would like to say one very important part, it has impressive cameras. You can capture great images in daylight and capture focused shots that can inspire the world. You can have gorgeous feelings on still images for heavy details. It does offer rich colors quality. The need for great battery phone is high on the market, as usual. And this phone has a great battery but there is some sort coming you might not feel happy with. The Huawei Mate 10 has a massive battery, it has 3340mAh non-removable battery you can use to spend all day. With moderate use, the smartphone will be able to work through the whole day without recharging. More intensive use of the battery discharges faster. The complete process of charging the phone with charger (5V/2A) within the kit takes about 2.5 hours. One very irritating point you might not go happily with is the lack of fast charging. In this year, a fast charging feature is on huge demand. What is the reason behind skipping this feature from Huawei? I do not know the strategy but so many people might get not happy with this activity. One more point is wireless charging but this is not a major issue. So many major flagships are available without fast charging and I have not seen so many people take care of this. Overall, Huawei Mate 10 has managed to impress users with its long-lasting battery. Not fast charging but charging with 5V/2A is not bad. If you charge the smartphone with a charger came out of a box, you should feel it smooth to charge without taking a long time. We have already mentioned the time of charging. When compared to other trendy phones in a market like Oppo F7 and Vivo V9, this phone has the ability to tackle the situation smoothly. Huawei Mate 10 Lite is really the interesting phone because it clearly shows how medium-range devices are trying to stand out among their peers. It is very durable, has a screen with a minimal 2:1 framework and in daily use running smoothly. With a few tweaks camera Mate, 10 Lite plays good shots in daylight. Portrait mode is doing its job well, and fingerprint scanner here is fast and accurate. If you close your eyes at all the shortcomings, Mate 10 Lite from Huawei can safely recommend buying. Smooth performance in everyday use. Solid build quality is impressive. Good quality camera in daylight is good. A lot of internal memory for storage. The fast fingerprint scanner and use of four cameras do attract. Huawei Mate 10 Lite is an excellent alternative for those who cannot afford the flagship company. He got a bright and recognizable design, as well as the best stuffing for its price. It can be called the perfect choice in terms of price and features. The main advantage became display receives the aspect ratio than the new mode and high resolution. Combined with autonomy and good performance this opens up great opportunities to work with content. When using this phone, you should Lite does not mean too much compromise because of a lower price tag. The all-screen design and tons of useful features to attract customers. And more, the 4 cameras are impressive to go with. I do not really claim that it can compete with Huawei Mate 10, this is a trimmed down version of original Mate 10. But it does not rather compromising unit. What does it sacrifice? You can the huge difference in display, quality, battery, and camera when compared to Huawei Mate 10 Pro? But why do not you see the difference in price? This is a beautiful spot between premium and mid-class smartphones you can buy. This is an eye-catching handset with a metal design that offers a strong grip. This is not easy to use with one hand, the use of two hands should give you a great experience. It has an IPS display panel instead of AMOLED but it does offer smooth use. You should not get irritated with daily usage, it has sharp color quality, however, you can feel a little low performance in heavy sunlight. When it comes to battery, it does offer a solid battery life of full day on average use. You can make calls all day and stay connected to the world of internet on a single charge for up to 24 hours of the day or I would like to say more than 24 hours. And the performance of Huawei-made Octa-Core processor is good, it does not disturb with so many interruptions when using some high-end apps. The performance processing unit and GPU can satisfy easily. You can capture inspirational images from both cameras of a phone, I should say from both sides of a phone because it has 4 cameras, not 2 cameras. This smartphone has to face many rivals in the market of Pakistan. It does not rank along among the list of besties. Xiaomi is one great competitor for the company with a wide range of smartphones, most impressive names from a company are Xiaomi Redmi Note 5 Pro and Xiaomi Mi A1. More, there is Oppo F7 – a solid option with stunning looks and great cameras that really attract the world. Oppo has managed to make the place in the hearts of people with its powerful range of phones. More, Vivo has started disturbing big names of a market with its interesting range of phones, the Vivo V9 is one powerful smartphone you can use to compete with. But overall, the Huawei Mate 10 Lite is one of best smartphone that covers almost everything that other smartphones (smartphones we just discussed) do offer. The Huawei Mate 10 Lite has a powerful range of features that keep you comfortable in a number of situations. You should add into watch-list when going to buy a new smartphone that does not cost a lot but feel like flagships. Huawei has the talent to inspire others with solid options in the market of smartphones easily.